A team of scientists is investigating whether growing kelp can reduce carbon-dioxide levels in the inland marine waters of Puget Sound. They also want to find ways to market that harvested kelp for food, fuels or fertilizers. HOOD CANAL — Scientist Joth Davis unspooled 150 feet of line holding thousands of tiny spores of kelp into Hood Canal, while Brian Allen dived underwater and affixed the line to a buoy. Submerged about 10 feet underwater, the bull-kelp seedlings will eventually form thick, slimy ribbons of brown seaweed and, in the process, take up carbon dioxide and other nutrients. Researchers hope it could offer a local strategy to ease the effects of ocean acidification — when seas absorb carbon dioxide released into the atmosphere by human activity, a phenomenon that raises acidity and threatens marine life. 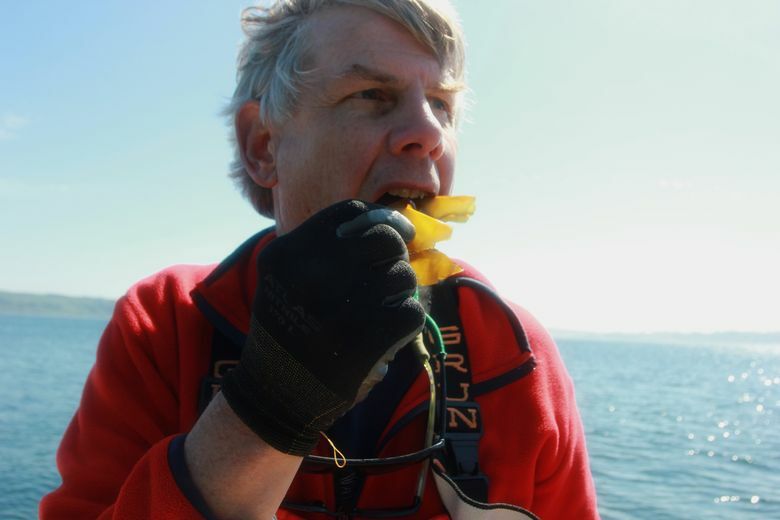 Davis and a team of scientists are investigating whether growing kelp can reduce C02 levels in the inland marine waters of Puget Sound. They also want to find ways to market that harvested kelp for food, fuels or fertilizers. “We know that kelp plants take up carbon dioxide and incorporate that carbon into their plant tissues. 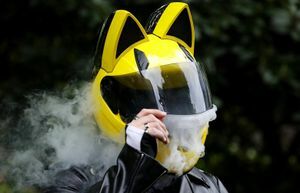 So we’re very hopeful that not only carbon but nutrients can be taken up and essentially removed from the water column,” said Davis, a senior scientist with the Puget Sound Restoration Fund. 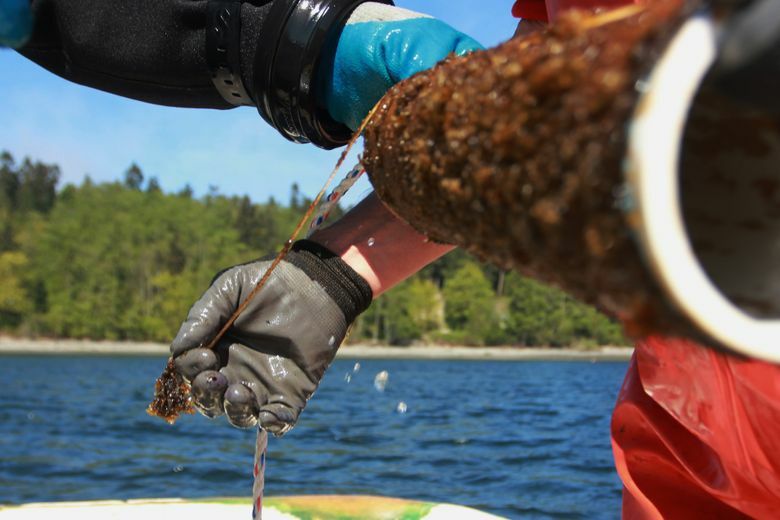 To test that hypothesis, a team led by Davis and Betsy Peabody will grow sugar and bull kelp over the next two years in Hood Canal, a fjord west of Seattle. 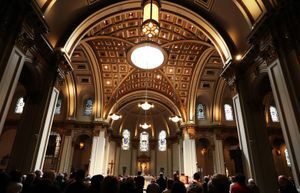 The five-year project, involving many partners, is paid for by a $1.5 million grant from the Paul G. Allen Family Foundation. Scientists from the National Oceanic Atmospheric Administration (NOAA) and University of Washington will monitor seawater chemistry in and around those farms and measure whether and how much CO2 the marine macro algae take up. “We know the reactions. 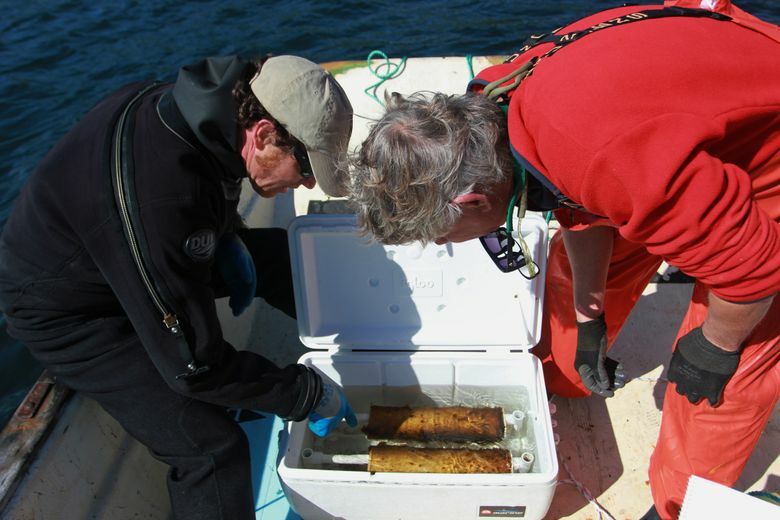 But we don’t know if they scale to be significant in nature,” said Jan Newton, a UW oceanographer who codirects the Washington Ocean Acidification Center and is on the team assessing the project. Research has shown that ocean acidification has damaged certain marine organisms such as oysters and corals. Ocean acidification interferes with the ability of oysters to build strong shells and threatens Washington’s $184 million shellfish industry. Kelp “has the potential for taking up a significant amount of carbon out of the water column. The question is: Is that going to be significant to help abate ocean acidification?” asked Richard Feely, senior scientist at NOAA’s Pacific Marine Environmental Laboratory in Seattle, who is also assessing the project. If successful, it could provide a local adaptive strategy for ocean acidification, he said. 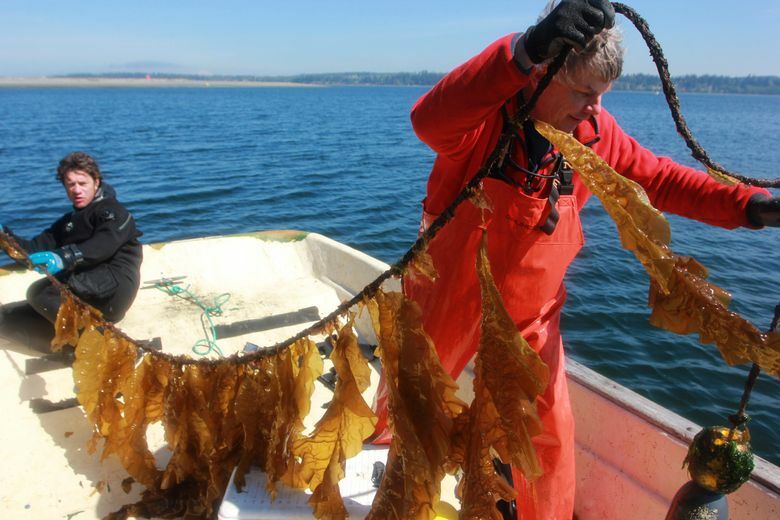 In Maine, the nation’s top seaweed producer, scientists report early but promising results during the first year of measuring the carbon uptake at a commercial kelp farm in Casco Bay. Using sensors inside and outside the kelp lines, scientists took measurements of the ocean’s chemistry to determine whether the ribbons of macro algae captured enough CO2 to improve surrounding waters. 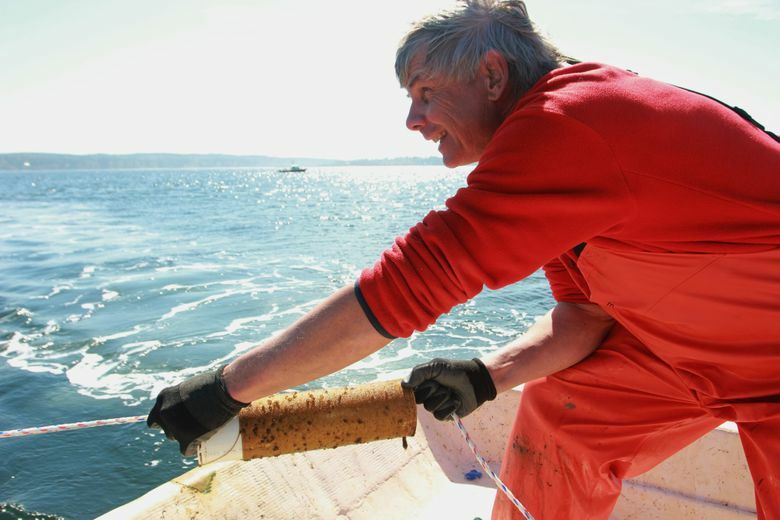 Nichole Price, a senior research scientist at the Bigelow Laboratory for Ocean Sciences in East Boothbay, said they found what she called “a halo” of changed seawater chemistry around the farm. The carbon saturation rate of seawater inside the farm was 25 percent higher, which would make it easier for organisms such as oysters, clams and mussels to form hard shells. Conditions in the kelp farm came out of the winter low saturation state one month earlier to surpass critical saturation thresholds when mussels start growing again in the spring. “The worry is that ocean acidification is going to slow the growth rate of cultured oysters, mussels and others to a point where they’re not going to be sustainable or profitable in the future,” Price said. Growing kelp near shellfish farms could help mitigate ocean acidification on a small, local scale, she said. While people harvest kelp recreationally in Washington state, there is no commercial seaweed aquaculture in the state. The pilot project would be the first, said Davis, who is also an oyster farmer. After planting out kelp seedlings grown in a lab, Davis pulled from the water, thick, glossy bands of seaweed to demonstrate what the plant would look like by the end of summer. They’ll harvest the small test plot and plant out another farm in the fall.